* The scent is citrusy and clean, not overpowering, and it is not long-lasting, so it will not interfere with cologne. * The covered tin packaging for the shave soap is perfect for building a lather. Even without a pre-shave oil, I was able to get a really close shave without cuts. * The flask for the aftershave is not only cute but well-designed. I felt a tiny bit of sting but it wasn’t a full-on burn. Summary: The Men’s Soap Shop is an example of a great company making a quality product. All of the products are handcrafted and all-natural – and, they work and are priced reasonably. When you compare them to Art of Shaving or other shaving lines – you get similar or better quality at a much more accessible price point. 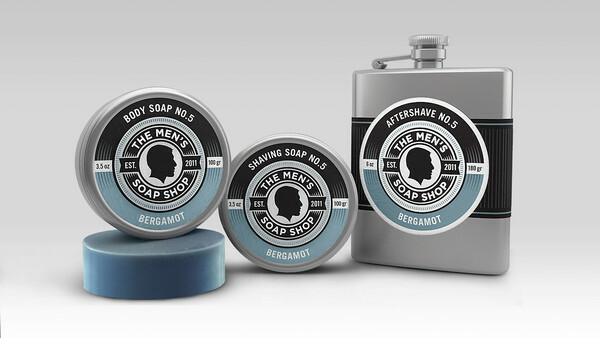 I love the packaging – the metal tins for the shave/body soap and the flask for the aftershave are brilliant. When using the soaps, though, be sure to rinse and the let the soaps dry before closing the container, or there might be an issue with mold. Another thing to remember – be sure to SHAKE the aftershave before use as the components do separate out (one of the side effects of being all-natural). Also, the lid requires a screw and then a lever lift (it took me a minute to figure it out). There are seven scents available – Vetiver, Lemongrass & Ylang Ylang, Cedarwood and Patchouli, Sandalwood, Bergamot, Bay Rum, and Herbal Blend. I tested the bergamot set which was refreshing and invigorating, yet dissipated as to not interfere with cologne on top. The Sandalwood aftershave was a little stronger, but would be a great base for anything you put on top of it. In addition to the body care sets, the soaps and aftershaves are available separately as well as in shaving sets that come with brushes and a metal bowl. At the reasonable prices, the sets would make a great graduation, holiday or birthday gift for the man in your life… or even for yourself. 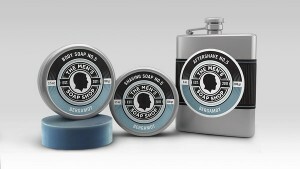 The Men’s Soap Shop products are available through their website and select boutiques. Disclaimer: Sample provided by publicist for review. No financial compensation is received for this review or any others. All opinions are mine. Image courtesy of The Men’s Soap Shop.